Human brains evolved to pay extra attention to anything that resembles a face. (Scientific term: “facial pareidolia”) [Rongzhong Li] built a robot sensor array with multiple emitters and receivers augmenting a Raspberry Pi camera in the center. 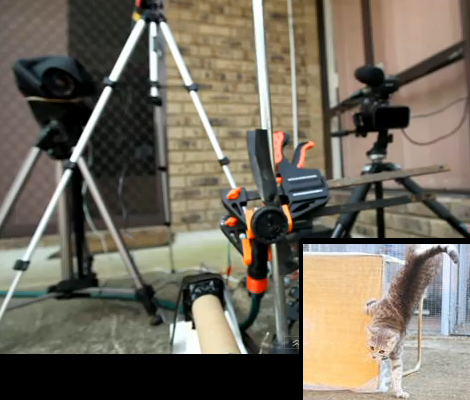 When he looked at his sensor array, he saw the face of a cat looking back at him. This started his years-long Petoi OpenCat project to build a feline-inspired body to go with the face. While the name of the project signals [Rhongzhong]’s eventual intention, he has yet to release project details to the open-source community. But by reading his project page and scrutinizing his YouTube videos (a recent one is embedded below) we can decipher some details. Motion comes via hobby remote-control servos orchestrated by an Arduino. Higher-level functions such as awareness of environment and Alexa integration are handled by a Raspberry Pi 3. The secret (for now) sauce are the mechanical parts that tie them all together. From impact-absorption spring integrated into the upper leg to how its wrists/ankles articulate. [Rongzhong] believes the current iteration is far too difficult to build and he wants to simplify construction before release. And while we don’t have much information on the software, the sensor array that started it all implies some level of sensor fusion capabilities. [Tuco] is a cat who shares the space of [Micah Elizabeth Scott]. He is a large tabby tomcat, and he is polydactyl, which is to say he has a congenital excess of toes. He is an extremely active and engaging creature and enjoys playing and interacting with her. We covet [Tuco]. Sadly for the rest of us who love cats, of course, unless we know [Micah] personally we’ll never have the opportunity to play with [Tuco]. She appreciates the cat-shaped void that will leave in our lives, and to help us she’s building a telepresence robot to allow the rest of us to interact with him in real time. Her idea is to make a flying robot equipped with a camera on a gimbal, and because to mounting it on a multirotor platform would be a hazard, instead she’s making something closer to the aerial cameras you might be familiar with from sporting fixtures, a motorised platform suspended from the corners of her roof space on a set of nylon ropes, that can move at will by adjusting the length of each tether. It is suggested that one day the device will be able to launch plastic bolts for [Tuco] to chase and to incorporate other interactive features to allow online users to engage with him. We are shown progress so far in the video introducing the project that we’ve placed below the break, she has completed a prototype windlass mechanism and worked on reverse engineering the gimbal mechanism for serial control. We’ll probably never meet [Tuco] in person, but we can’t wait to interact with him online. [Domiflichi] likes his cats, but not the drudgery of feeding them. So, like any good engineer, this simple problem became his next project: building an automatic cat feeder. Based on an Arduino, his creation beeps to let the cats know that it is dinnertime, then dispenses food into a number of bowls. There are also buttons for manual control. This lets him give individual cats a separate feeding. Rounding out the feature set, a DS1307 RTC tracks the feeding times. One of the most interesting parts of his build is the transfer from breadboard to protoboard. This usually involves taking apart a working version, then putting it back together and trying to figure out why it doesn’t work anymore. [Domiflichi]’s problem (detailed in a follow-up post) was figuring out how to program the real-time clock module to set the time, because it looses the time when you disconnect the power. Rather than use the Arduino to program the RTC, he used the battery backup feature of the RTC chip, programming it on his computer and then soldering it onto the board. He went on to remove the backup battery after the chip was in place. That’s a solution that will no doubt have many readers waving their fingers disapprovingly, but it worked. It may seem overly complicated, but his project is worth checking out to see how he approached some of the engineering challenges. The food hoppers themselves are off-the-shelf cereal dispensers. We’ve seen other designs bootstrap this mechanism with 3D printed augers. Ah, to live the life of a cat. The lazing about, the food delivered on demand, and the elevators – oh the glorious elevators. No you didn’t misread and we haven’t gone crazy. We were sent a link to the video below just the other day, and while it is nearly two years old, it was new to us. From the very brief description on YouTube, it looks as if the elevator senses the cat’s entry using infrared, locking the door behind the cat before transporting it to another level of the house. While it’s often implied that cats are incredibly lazy, this contraption definitely takes things above and beyond the norm. It’s a pretty ridiculous system if you ask us, but it’s pretty compelling just the same. If you can find any more information on it, we’d love to hear about it in the comments. If you can’t, feel free to speculate as to how you would build a cat elevator, or elaborate on the crazy contraptions you’ve built for the lazy felines in your life. Commenter [TheCreator] reminded us of this fantastic video from [Craig Turner] who you may recognize from SBS’s Top Gear Australia Video Competition. You see, [Craig] has been struggling for some time with the problem of neighborhood cats relieving themselves pretty much all over his stuff. Through surveillance he identified (and named) around 9 separate cats sauntering into his yard during the wee hours of the night. The only issue now was to humanely discourage them from entering his yard. The best solution, in this case, was a simple spray from the garden hose, but who is going to stay up all night to watch for cats? [Craig]’s ’75 Galant happens to have aftermarket door locks. These typically contain a simple powerful 12V actuator that will push or pull when given current. The actuator is strong enough, and has enough travel, to depress your typical garden sprayer handle. The lock actuators even include enough mounting hardware to tack everything together. The only irreversible part of the hack appears to be the hole drilled into the sprayer’s handle. The job of cat detection is handled with a PIR sensor (sourced from his home security system) and a paper towel tube to narrow the detector’s field of view. Placed at animal height the PIR detector works like a trip line, and flips a relay connected to an array of devices: A bright LED lamp, a DSLR set to take several quick photos of the victim, An HD video camera, and the sprayer solenoid. This whole rig is placed at a convenient choke point and hilarity ensues! A schematic is included in the video but is pretty difficult to interpret, we transcribed it for you. Some details are unclear but essentially a few relays are stapled together to provide either high or low switching signals. Check out the video, [Craig]’s schematic, and our interpretation of [Craig]’s schematic after the jump! 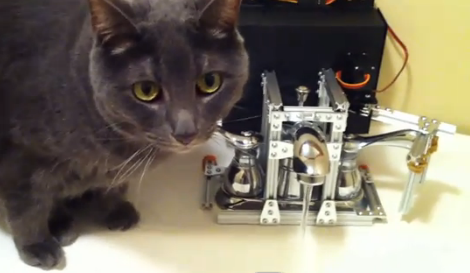 Like many of us [Chris Dillon]’s cat prefers to drink cold fresh water directly from the tap. However, unlike us, [Chris]’s feline buddy is too preoccupied with cat stuff to bother flipping off the faucet after its use. As it turns out, this was an excellent opportunity not only for [Chris] to flex his project muscles, but also to lay the groundwork for future home automation projects. While most of us may go for a simple solenoid [Chris] had to make the rig completely reversible. The result is an automated faucet control which involves an infrared sensor, Arduino, and tight fitting rail system with a servo to operate the sink handle. After getting all of the hardware and the sensor sorted [Chris] went on to add a data logging PC to the mix. The faucet setup communicates with a Linux server via Xbee modules, and populates a MongoDB database. The setup even allows [Chris] to flag false positives (human sink use for example) and produce charts of his feline friend’s water usage. We suspect the cat will be none too pleased when it gets its water bill. Don’t forget to check out [Chris Dillon]’s site for details on the project including code and a list of lessons learned. Also, since this is the internet after all, we have several other cat related projects for your viewing pleasure. Check out a video of the setup in action after the jump. Sometimes, pets need to be trained to stay away from certain things. Over at sump.org, his cats needed to be kept out of his room. 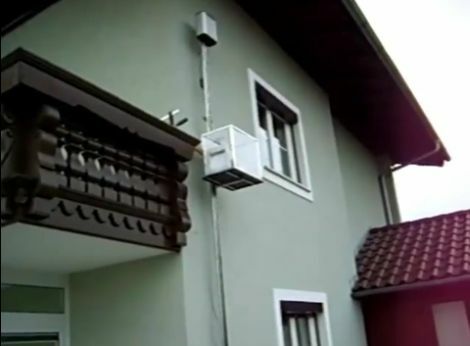 He used their natural fear of water by creating the waterwall, a motion-sensing device that sprays water. The project is incredibly simple and uses very few components. It is based around an IR intrusion detector and a windshield washer pump. Although that worked well enough, he also hooked it up to his computer via the parallel port so that he could take pictures as the cats (or people) are sprayed. Although the project is old, it shows how few components are really needed to achieve this kind of behavior.